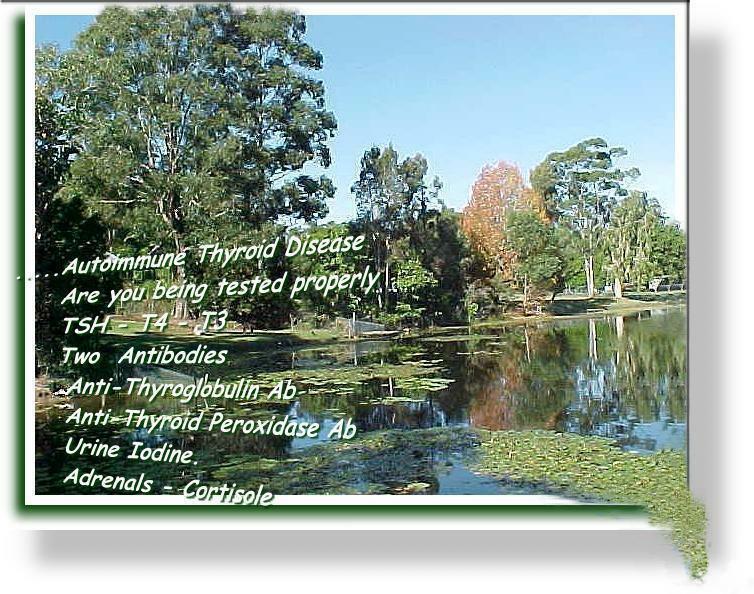 Thyroid Australia (Brisbane) - SUPPORT - RESOURCE INFORMATION The material on this web site is sourced from well known local and international authorities on the thyroid and from peer reviewed medical journals. Please make your doctor aware of this if you present any of the material from this web site to him or her. Please be aware some of the symptoms of Hashimoto's Disease (underactive thyroid) as well as those of Graves Disease (overactive thyroid) can be shared by both conditions with symptoms sometimes being vague and diffuse. Please note: * Some numerical and other statistical information in the article Hypothyroidism and Hyperthyroidism are old school Endocrinology and are still being practiced in some specialist circles today, yet the fundamental medical science of the information is solid. It is published here in its original text for insight into these two predominate Thyroid conditions and of due respect to the authors. This Support Information is suitably designed to be printed and discussed with your doctor. Please be aware some of the symptoms of Hashimoto's Disease (underactive thyroid) as well as those of Graves Disease (overactive thyroid) can be shared by both conditions with symptoms sometimes being vague and diffuse. Please note: * Some numerical and other statistical information in the article Hypothyroidism and Hyperthyroidism are old school Endocrinology and are still being practiced in some specialist circles today, yet the fundamental medical science of the information is solid. It is published here in its original text for insight into these two predominate Thyroid conditions and of due respect to the authors. This Support Information is suitably designed to be printed and discussed with your doctor. Links are published in .doc and .pdf format for easier saving or printing. We maintain that every diagnosed Thyroid condition is a personal issue and keep an open mind on medication, understanding what benefits one person, may not be the same for another.